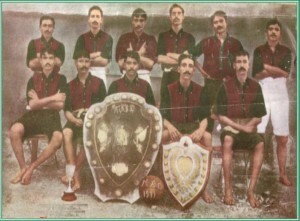 For the first time in the History of Indian Football, Mohun Bagan, an Indian Team, beat the British side in the final of 1911 IFA Shield and lifted the shield for the First Time.1911 victory news has been published in the news papers throughout the world.Till today, the 11 players are known as the Immortal Eleven.In 1989, Govt of India published a postage stamp in memory of the match.1911 victory became an event of National Pride and a spark of Nationalism for the oppressed Indians under the British Rule. 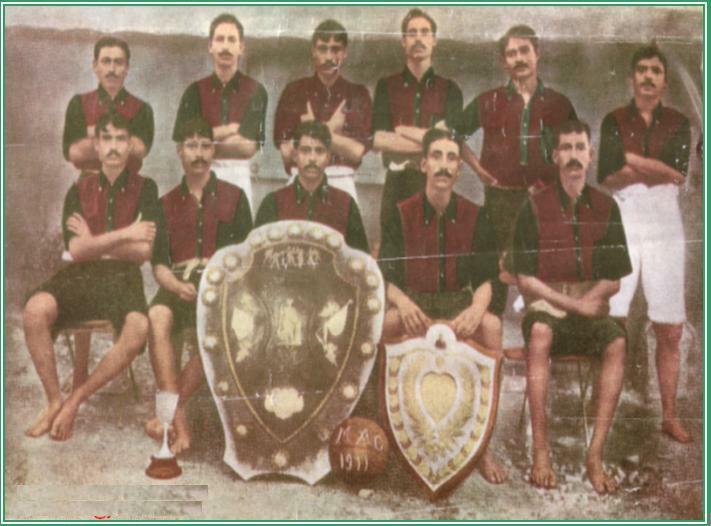 From 1910 to 1912,Mohun Bagan consecutively triumphed Bengal Jimkhana Shield. Obviously Mohun Bagan earned the highest position among all the Indian teams. ‘The members of the Moslem Sporting Club were almost mad…rolling on the ground…on the victory of their Hindu brethren.’ –The Mussalman, Calcutta. That year Mohun Bagan also won the Gladstone Cup and Asanulla Cup. But in the next year, 1912,it won only the Asanulla Cup. This year’s win was the third consecutive win. At the beginning of the 1913,Shibdas Bhaduri handed over the charge of captainship to Habul Sarkar.But unfortunately no victory added to Mohun Bagan’s credit this year. It was this year when Gostho Pal, better known as the Chinese wall, joined the Club as back. His first match was against Dalhousie F C at the age of 16 only. He continued to play for 22 years thereafter as successful back. He also took responsibility of captainship from 1921 to 1926. In 1914,for the first time, Mohun Bagan was given the opportunity to take part in Calcutta Football League’s Second Division, as a national team. First year 91 Highlanders won the League. Mohun Bagan and Messerers shared the second position. As 91 Highlanders was a military team, it was eliminated from the League, as per IFA rules. For the first Division League, Mohun Bagan confronted Messerers on the Caledonian Ground. First day resulted in a draw, but Mohun Bagan lost on the second day by 2 goals to 1. But fortunately, Mohun Bagan got the opportunity to compete in the First Division, since RGA team emptied a position by withdrawing from the League. Mohun Bagan succeeded in occupying the fourth position in the League. That year Mohun Bagan’s Junior Group reached the Semi-finals of the Trades Cup as well as the Coochbehar Cup. On the other hand, Mohun Bagan reached the Semi-finals of IFA Shield Competition. In 1916, Mohun Bagan occupied the second position in the Calcutta League. In 1917,Club lost to Middlesex team in the IFA shield.